A short description of the class. This summer a group of kids will meet for one week at LexMedia to produce a TV show. This will be a hands on experience. From coming up with the ideas to writing scripts, acting and running the studio cameras, it’s all up to the kids. The participants will work as a group to come up with show production ideas and will assist each-other in every aspect of production. Typically the program is made of one large show like a game show or news show etc. Around this bigger show are the shorter productions. They can be fake commercials, fake promo’s for movies etc. What is finally created is dependent on the imagination of the participants with staff guidance and encouragement. 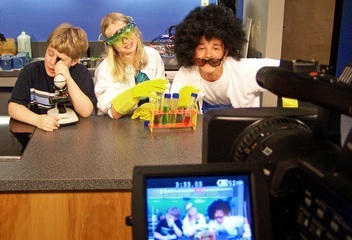 This years’ summer kids TV production class will take place July 18th-22nd from 1-4pm at the LexMedia studio. The class is open to kids 10-13 years old. There are 12 slots available on a first come, first served basis. The sign-up period for this class is now open.